Bealls, online at beallsflorida.com, is an online department store offering a great selection of fashionable apparel and accessories for the entire family. Bealls carries women's clothing, dresses, tops, bottoms, men's apparel, outerwear, plus size apparel, kid's clothing, junior's clothing, shoes, lingerie, handbags, purses, jewelry, watches, home and bath decor, kitchen appliances, patio and grill items, and more. Bealls offers brands like Gloria Vanderbuilt, Hamilton Beach, Easy Spirit, New Balance, Columbia Sportswear, IZOD, DKNY, Jones New York, Vintage America, Alfred Dunner, and many more at discounted prices. 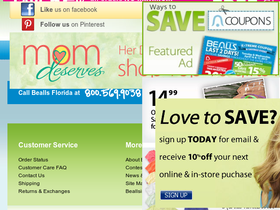 RetailSteal.com has all the latest beallsflorida.com discounts, Bealls promotions, and Bealls coupon codes. Bealls ships within the United States, including Alaska, Hawaii, U.S. Virgin Islands, and Puerto Rico. Standard shipping rates are based on order total. Bealls also offers international shipping through MyUS.com. See site for more information. Enjoy a 10% discount on any purchase from Bealls. Click here to shop and use coupon code to save on brands like Cuisinart, Easy Spirit, Nine West, and others. Shop the Red Hot Deals at Bealls and save 50% on apparel, shoes, accessories and more. Click here to save big on brands like Notations, IZOD, Dockers, and others. Shop at Bealls and enjoy 20% savings sitewide. Click here for code. Enjoy $15 savings on your entire order from Bealls when you use this coupon code online. Use code on orders of $150 to qualify. Enjoy a $5 discount on your entire order from Bealls when you use this coupon code online. Use code on orders of $50+ to qualify. Save up to 55% on luggage from BeallsFlorida.com. Click link to shop and save on JanSport, Windham, Nine West, American Flyer, and others. Save up to 50% on lingerie from Bealls. Click link to save on Maidenform, Bali, Playtex, Vanity Fair, and others. Check out the latest coupons and events from beallsflorida.com for savings on lots of great apparel, accessories, and home ware. Click here to shop. Enjoy free shipping on your Bealls purchase when you spend $75 or more! Shop at Bealls and enjoy free shipping on orders $65+. Click here for code.